When the dark, fanatical Father Michael (CHRISTOPHER LEE) was defrocked and excommunicated from the Church, he sought the ways of the Devil. He formed a closed convent in southern Germany, and called it "The Children of the Lord." But the lord in question was the Devil-figure of Lord Astaroth, and the innocent children were reared in the ways of Satan himself. 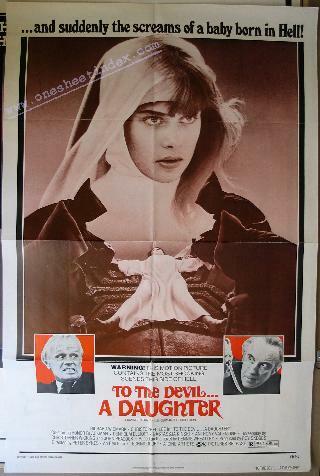 One of them, Catherine Beddows (NASTASSJA KINSKI), had a special destiny to fulfill: She was pre-selected at birth to become the Devil's daughter on her eighteenth birthday and reign as Astaroth's representative on Earth. To save his own skin, Catherine's father, Henry (DENHOLM ELLIOTT), signed his daughter's future away when she was born. But the yearly visits which Henry made to her in Germany had eaten away at his resolve. and expert on occult matters. Henry entrusts Catherine to Verney's care and though the author is initially skeptical of the fantastic tale which the father unfolds he nevertheless decides to investigate. But Verney had not reckoned on the awesome powers of Father Michael and his dedicated followers. He soon discovers that Beddows has given him only a hint of the terror ahead. Fearful of losing the young girl, Father Michael is prepared to go to any length to enforce his contract with her father. Innocent people die violently, and the spectre of Satan throws an obscene shadow across the lives of all involved. Finally, in a mesmeric and cataclysmic confrontation, Father Michael and Verney are ranged in physical and mental combat. The prize: Catherine. A HAMMER/TERA ANGLO/GERMAN CO-PRODUCTION. AN EMI FILM.